In modern time, equal temperament in the mainstream of the tuning system. Challenge towards equal temperament started from old time. There is a record left around 1600. In equal temperament there are 12 notes lined up in order equally. mean-tone in Renaissance music where polyphony and harmony was established, Well-temperament for Baroque music. Equal Temperament become popular accordingly from the industrial development. Red line of the bar graph is A of 110Hz, A of 220Hz, A of 440Hz, A of 880Hz. The frequency increaces twice according to one octave and describe a parabola. Every frequency on the note of equal temperament synchronizes this beautiful parabolic orbit. This is also a characteristic of equal temperament. The characteristic of the chords is equally placed major 3rd of 400 cent. There is a noticeable howling. But in piano, this makes a comfortable vibrato effect. The 5th of 700 cents (2 cents narrow than the pure 5th ) is almost not noticeable. 5th of all key sounds almost clear. On the other hand, the modern piano have a wide dynamic range. Also, from difference of the touch, you can create various expression. and can express more freely. It is not certain why equal temperament started to become wide spread. When the piano tuner tuned the piano, It might have been quite simple to divide one octave to 12. When you try to reduce the narrow 5th of Just intonation, 3rd of Pythagorean, in coincidence it happened to become equal temperament. 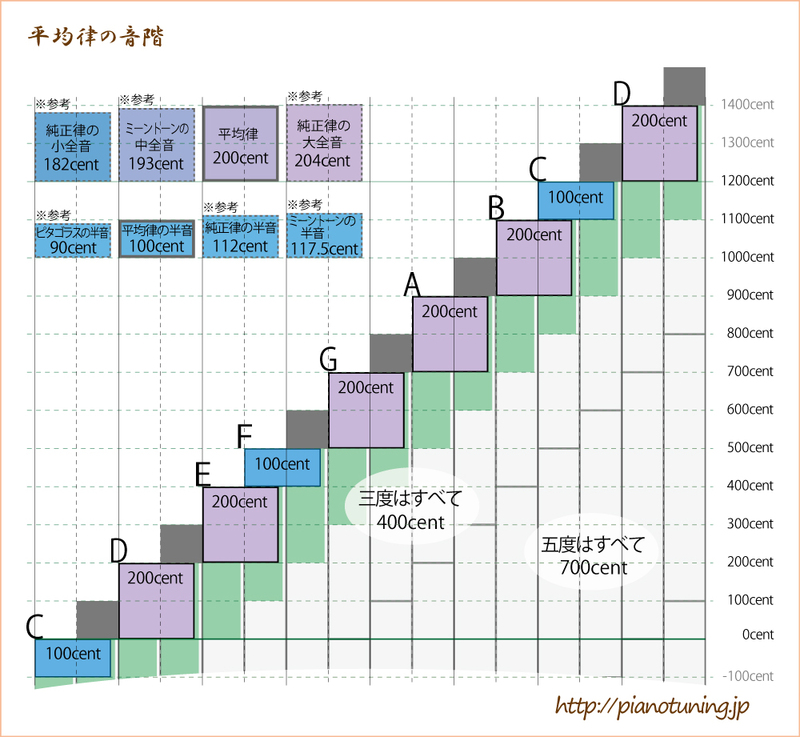 May be there is a person, who can recognize the difference of pitch of 100 cents semitone or 200 cents while tone. May be the challenge of Mathematicians and Physicians. When this is applied to tonal stairs, it is like a modern townscape lined neatly. You can even run down the stairs in full speed. According to the modernization of the industry,increased production of piano, many piano tunes were needed. But it is not easy to inherit the traditional temperaments. like it was easy to draw on the graph. The characteristics of piano and the beauty of equivalence matched closely to the modern time. In recent years, old records are reproduced and we can listen to these sound from sources such as You Tube. 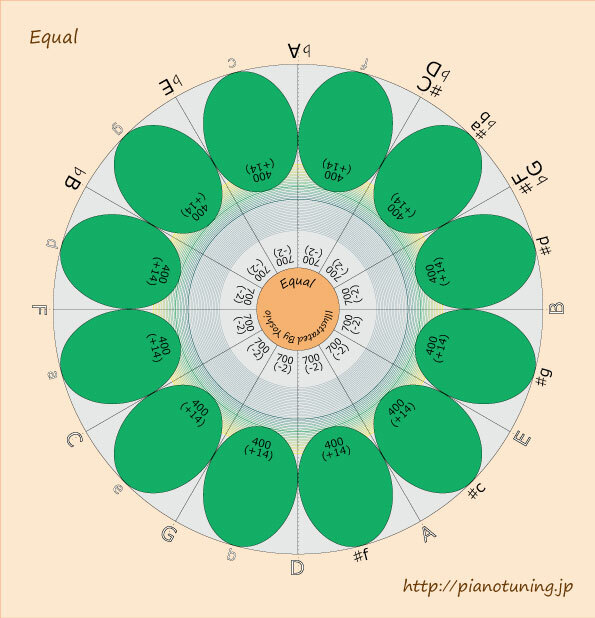 You can hear the characteristics of equal temperament from these piano sound. you can say that equal temperament was already the standard. It is also very interesting that the time corresponds when the quality of the piano was very high. 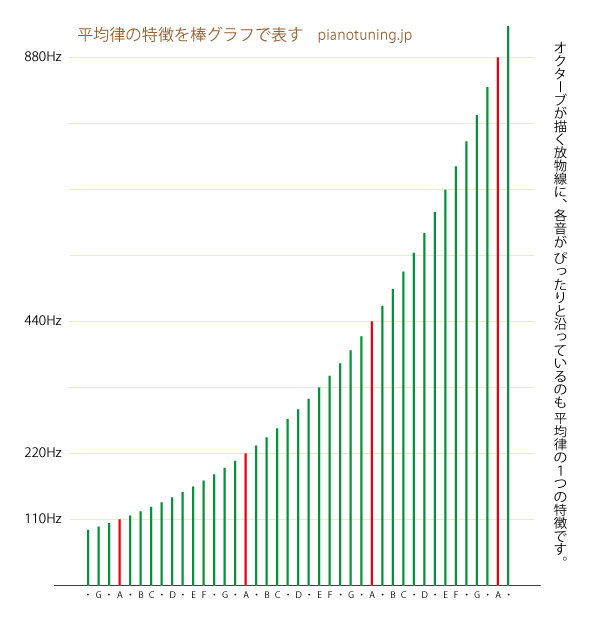 There are 230 strings from low to high. and tune according to this produce. From the construction of the overtone of piano, the 5th and 3rd of the high tones become wider. This sounds almost like Pythagorean. Also, the lower tone makes a big influence in whole sound. Starting from piano and keyboard instruments,woodwind instruments (recorder, flute, clarinet), and guitar etc.